Appreciate if you could give me feedbacks on ways on how to get to Disneyland from Central station, and from Disneyland to the Peak. Harbour Grand Hong Kong is 5-star hotel located at 23 Oil Street North Point Hong Kong Island, Hong Kong. It is about 3 minutes walk from the Fortress Hill MTR station, Exit A. 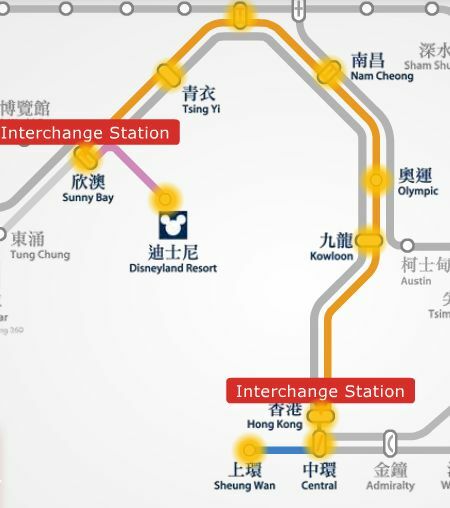 Here's your travel option in getting to HK Disneyland from the hotel. 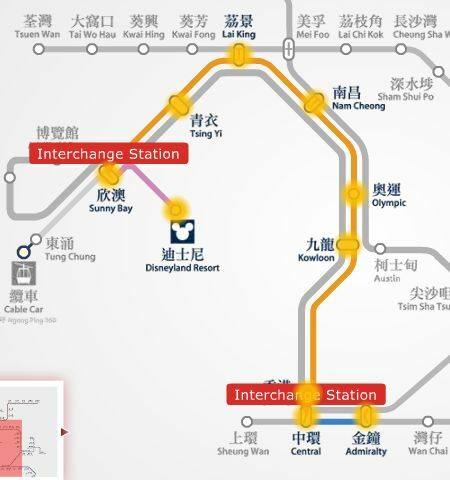 By MTR train: Island Line to Central station --> walk to the adjacent Hong Kong station --> Tung Chung Line to Sunny Bay --> change to Disneyland Resort Line to Disneyland and then take Exit A. Total train travel time is 48 mins @ HK$21.7 - half fare for children under 12 yrs old and seniors above 65 yrs old. By taxi: A taxi straight to HK Disneyland from the hotel is about 35 mins drive @ HK$240. When taking a taxi, the place to worry about is just somewhere at Hong Kong Island, after that it is already a highway thru Disney. I would safely add a budget of 20 minutes for that trip for a possible traffic jam specially if traveling during rush hours. The only advantage of buying the Disney tickets online is that you can avoid the line to the ticket booth and yes, seniors visitors are discounted. Hi I'll be staying in Harbour Grand Hotel near Fortress Hill MTR. Will be with 2 kids aged 3 and 1 year old.. Which is the easier way to get to and from our hotel to Disneyland? Is it faster by taxi or by mtr? I know taxi will cost almost $240? Am abit concerned about the many changes of train if I take mtr. Will there usually be a traffic jam heading out from hotel on a Friday at aroud 9am or back to hotel at 830pm? Getting to Disneyland from HK Airport, please Click Here. Getting to Chungking Mansions from Disneyland, please Click Here (post dated october 28, 2010). Getting to Victoria Peak from Ocean Park, please Click Here (post dated july 20, 2011). It's spring on May in Hong Kong. The weather tends to be warm and humid with temperature ranges from 20-25 degC and may require light overcoat or a sweater. 1. What would be the best transportation in going to Disneyland from Hongkong Int. Airport? How long is the travel time and the cost? 2. What about the transpo from Disneyland to Chungking Mansions in Kowloon? How much would it cost? 3. Is Ocean Park near The Peak? 4. Is it good to travel and visit HK tourist destinations during May? Hope I'll hear from you soon. Thank you! The best location to watch the famous nightly show "The Symphony of Light" in Hong Kong is along the Tsim Sha Tsui promenade where you can also visit the Avenue of Stars attraction and adjacent to the TST Star Ferry Terminal. Most efficient way to get there from Disney hotel is by taking the MTR trains. The train route map and all the instruction details can be read in here but you need to take the East TST Exit J. See this location map to where exactly you go for a good spot to view the Symphony of Lights. Yes, please bring your child as kids loves to watch this kind of attractions. Also, I would like to know if I am staying at Disney but want to get to Kowloon in evening specially for 8 clock Symphony of Light show. How and where should I go and the best way to get there. Is it feasible to go with my 7 yr old? For details about you hotel location and your transportation options in getting to Ocean Park from Hong Kong Disney hotel, please click here. Taking a taxi is also ideal in your group. For a day trip to Macau, here's the most efficient route from your Hong Kong Disneyland hotel. I am staying in Hong Kong Disney hotel for 4 nights and I want to do ocean park on one day and Macau by ferry on one day. Please suggest the best routes and transportation to take? we are 3 adults and a 7 years old child. Re: How to travel from Central to Disney. Central MTR station and Ocean Park are located in the Hong Kong island while the Hong Kong Disney is in Lantau island. See map below and click the place markers. Travel route map between Central MTR station, Ocean park, and Hong Kong Disneyland. Here's my suggestion if want to travel those places considering you are starting from Central MTR station. The most efficient way to travel to these places is through MTR trains and a short bus ride. But if you're in a group of 3 to 5 people, I would prefer a taxi. Here's the travel sequence to those places to save time and money. Take the Island Line trains from Central station to Admiralty station, these two station are adjacent to each other (3 minutes @ HK$ 3.7) and then take Exit B. Upon exit, you'll see the Admiralty (west) Bus Terminus. Take the CityBus no. 629 an express bus to Ocean Park (15 minutes @ HK$10.6). From Ocean Park get back to Admiralty MTR station (see below MTR travel map between Admiralty to Hong Kong Disneyland). Hope this help to plan your Hong Kong travel and have a good trip!